I love the sense of grandeur and awe that an amazing fantasy setting can produce. I will forever be entranced by well-described castles, elven tree cities, dwarven mountain catacombs, and dragon eyries, as well as some of the more spectacular magical elements those locations can contain. Sometimes, however, the world we actually inhabit contains fantastic elements that exceed the imagination of any author. Here I list the top three I have recently discovered. When I first saw a picture of this tree, my instant reaction was, “Who in the world would paint a tree? The mosaic-like pattern of bright colors on the rainbow eucalyptus look too staged to be real, but it turns out that rainbow eucalyptus are a thing. Native to the Philippines, this tree can be found in a limited number of other places where the air is warm and the ground is wet. It can grow six feet wide and over 250 feet tall in its native habitat. Its vivid colors come from the random shedding of patches of bark. The newly exposed bark starts out a bright green color, then fades to darker green, blue, purple, pink-orange, and maroon in that order. 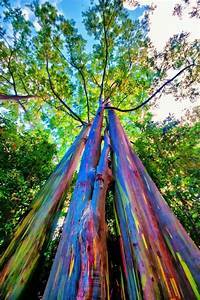 Because the shedding of bark happens randomly, different patches of the tree exhibit different colors, giving the tree its rainbow effect. You can view several pictures of this tree here. When I was a teen, there was a song (which I can’t remember the title of) about building castles in the sky. Apparently another song about the same idea is gaining notice now. All of this recognition begs the question, what does “building castles in the sky” mean? 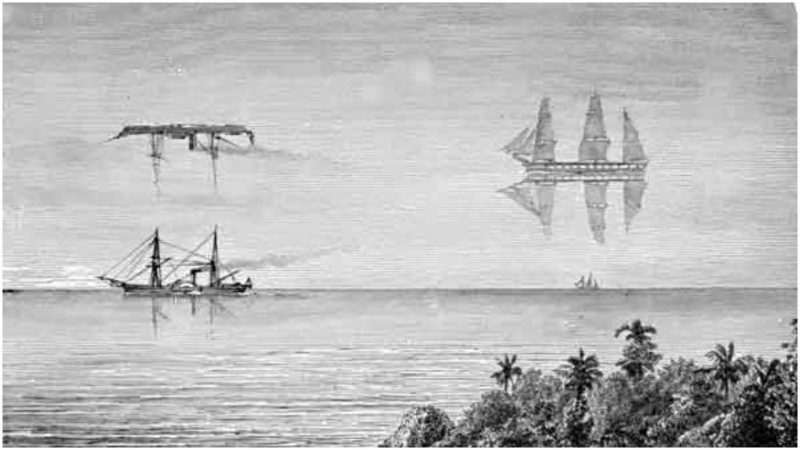 The phrase is based on a type of mirage known as the fata morgana, which occur frequently near the straits of Messina. Named after Morgana le Fey in Arthurian legend, this type of mirage is built of multiple images that compile to look like floating castles and cities, among other things. Their name comes from the archaic belief that Morgan created these images to lure sailors to their deaths. Added side note: this natural occurrence is also responsible for the myth of the Flying Dutchman and other ghost ships. To learn more about the fata morgana, check out this detailed (but slightly colorful) article on Wired.com. 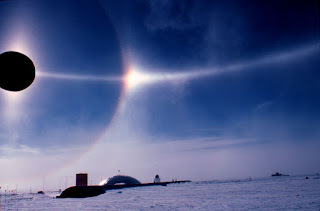 Also called the sun dog, the parahelion is another form of optic phenomenon that occurs when sunlight is refracted and scattered from ice crystals in the atmosphere. A parahelion appears as bright patches of light in a halo path around the sun and can occur anywhere in the world. The ultimate parahelion, manifests as four spots of light: one each above, below, and to the right and left of the sun, all at a distance of about 22 degrees away from the sun. A really crisp parahelion will even include a parhelic circle, which is a horizontal white line crossing the sky on the same level as the sun. You can see a stunning example of the parahelion here. Although there is some debate about whether the occurrence in this video is real or staged, it’s an excellent example of the amazing effect the parahelion could possibly produce. I'm curious to know what awe-ispiring, sense-of-mystery-inducing things you have found lately. Please share them with me in the comments. Fascinating post! As a microbiologist, I must put in a plug for the amazing world of microbes and immune systems. The Angel Glow phenomenon is really interesting. Basically, it's glow-in-dark bacteria producing anti-microbials. That's really cool! It'd be amazing to see these in person. Thanks for sharing, Lauricia.